Top » KC Brains » Brasil x K.C. » Brasil x K.C. Brazil x K.C. is a stable sativa cross of Mango Vermelho from Paranaiba, Brazil and K.C. 606. Her cannabis seeds were designed specifically for indoor cultivation - this cannabis strain doesn't grow higher than 90 cm, giving you a typical sativa look - dark green narrow leaves growing around a firm thin stem and leaving enough space and light for thick compact buds to fully develop. As a typical sativa, Brasil x K.C. tends to grow as a Christmas tree shape, so it's recommended to keep her under control by tipping the tops of her branches. It's not just make her look prettier, but will also help concentrate on producing fewer clones with stronger vigorous grown. This marijuana variety is a great yielder. Usually, you can get as much as 150 gr. per plant. Excellent, considering the size of this petite beauty. Flowering takes 63-84 days after which new bud formations will start spreading quite a strong aroma, which, however, is not going to smoke you out of your home. 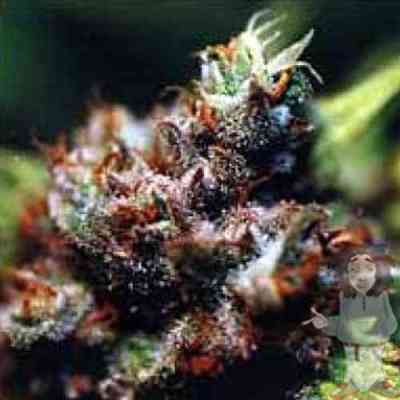 The buds are extremely big and sticky, TCH content is said to be as high as 16-18%. Some cannabis grower prefer to cultivate these cannabis seeds outdoors. In that case, Brasil x K.C. can shoot up to 2.5 - 3 m. high with a yield as much as 800 gr.per plant. Growing outside, she still remains an early maturing marijuana variety. Flowering takes 7-10 weeks. You can start your first harvest already in September and keep through October.